At Maryland Vision Center, Dr. Sunil Thadani provides patients in and around Frederick and the Baltimore area with access to necessary vision and eye health services including treatment for cataracts, corneal diseases, macular degeneration, glaucoma, dry eyes, and many other conditions and issues. 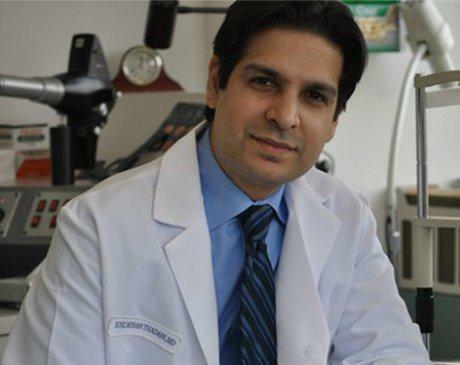 Dr. Thadani obtained his Medical Degree from the George Washington University’s School of Medicine and Health Sciences. He received his Masters Degree in Public Health at the Yale University School of Medicine. Dr. Thadani is also a board certified ophthalmologist and completed fellowships at the Ophthalmic Consultants of Boston and the New England Eye Center in Boston. There he specialized in eye surgery and corneal disorders. He served as Chief Resident at the Washington Hospital Center in Washington D.C.
At the practice, Dr. Thadani devotes his time to educating his patients and ensuring they receive the most effective, most advance eye care and treatment. His patients describe him as knowledgeable, professional, and compassionate. Throughout the community Dr. Thadani volunteers his services to provide awareness and screenings for conditions such as diabetes eye disease and glaucoma. He has also dedicated his time to helping those in underserved areas of the world through surgical mission trips. Dr. Thadani and the staff of Maryland Vision Center welcome all new patients. The practice also accepts most major forms of insurance.